More than a dozen years of successful initiatives have deepened our organization’s understanding of the community change process. This perspective informed our Community Action Model, which is relevant for a variety of community health goals. 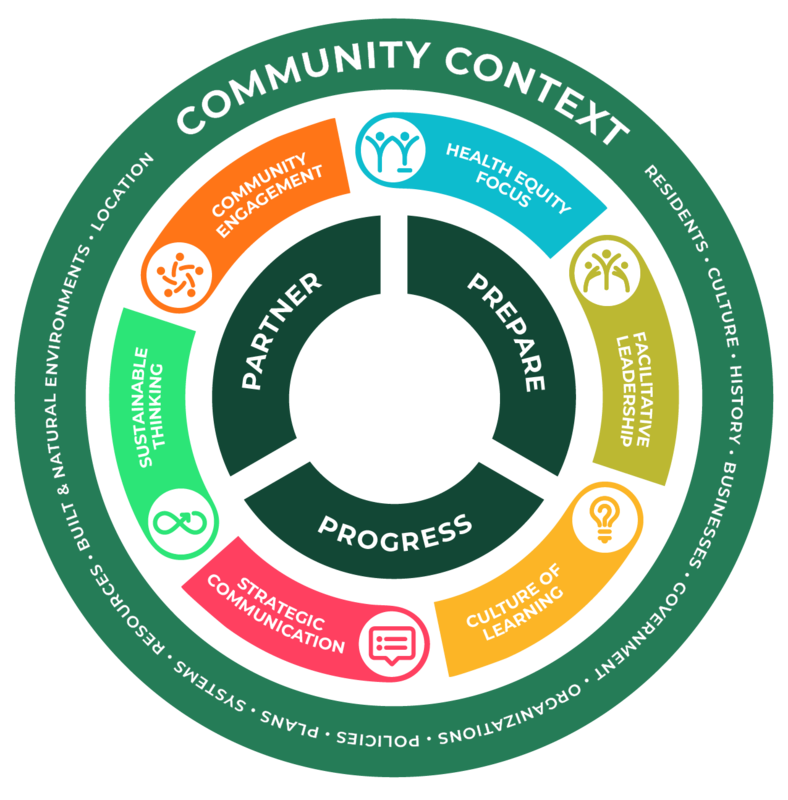 This model highlights the importance of a community’s context, defines six essential practices for success, and outlines a 3P Action Cycle: Partner, Prepare, and Progress. It also presents some expected impacts. This model can be useful to community coalitions, local leaders looking for a collaborative process to creating healthier places, and to funders seeking a tested approach for local investments. Community context plays a vital role in healthy communities work. Every community has its own culture, assets, history of achievement, and challenges on which to build. When funders, local leaders, and partnerships fully recognize and understand these unique community settings, it helps direct strategies and tactics to better align with and leverage various dynamics at play. Healthy Places by Design believes six Essential Practices are critical for creating meaningful and sustained change in communities. They address how a partnership can be most effective and sustain its impact and who it should involve and strive to serve. The 3P Action Cycle is not necessarily linear; rather, this community change process is intended to be iterative. Healthy Places by Design recommends a community change process that is intentional about partnership, preparation, and strategic progress to change policies, systems, and environments for improved community health. Local partnerships can achieve impressive and lasting results from healthy community initiatives that fully employ the Community Action Model. These impacts stem from actions taken during the 3P Action Cycle, from integrating the Essential Practices, and from each of the strategies that are implemented. Promotions and programs can help generate media attention and deliver early wins that build public support for more complex policy and systems changes. The Partner and Prepare action steps result in stronger relationships between partners and community members, motivating and mobilizing them to work for a healthier community. Local leaders and coalitions will also have a better understanding of their community, more experience setting priorities, new health leadership opportunities, and success in leveraging resources. Successful pilot projects of policies (like shared-used agreements, complete streets design guidelines, and supermarket and garden ordinances) and built environments (like new sidewalks, gardens, and farmers’ markets) build credibility and capacity, allowing healthy community work to deepen in a community. When policies and environmental changes that support health are maintained, they not only create improved community conditions, but can also outlast shifting budgets or turnover in organizations. Other impacts can include new investments; re-directed budget priorities to support more healthy community projects; stronger relationships and collaboration between residents and decision makers; and new staff in various organizations and agencies for ongoing work. Systems changes often lead to an integrated web of health supports, with multiple sectors coming together to align their priorities around the community’s health and wellbeing. Health becomes embedded into institutional processes. For example, local government departments may change the way they operate by prioritizing spending, new development, and built projects in order to maximize services and policies and provide safe, affordable access to healthy lifestyles for all residents. Community norms begin to shift toward healthier patterns through a mutually-reinforcing increase in supports for healthier behaviors and public demand for healthy living. As the integrated web of health supports deepen and mature in communities, residents become healthier. Partnerships and relationships also continue to evolve with intention and increasing capacity, enabling coalitions to address other important quality-of-life issues. Residents have more equitable health outcomes and maintain influence in decisions that affect them and their community. Businesses, governments, nonprofits, and coalitions understand their role in reinforcing residents’ expectations and priorities. Communities experience a host of benefits from their long-standing priority on health, including increased civic engagement, employment, educational attainment, safety, and quality of life. Successful and sustainable healthy community change initiatives will ultimately create a culture of health in communities, where health is embedded in the community’s identity. The neighborhoods, schools, parks, streets, food venues, and other public spaces where the changes occur support and reflect healthy patterns of living, learning, working, and playing, serving as role models to other communities just beginning their path to health. In 2003, high poverty rates and old infrastructure were affecting the health of residents in Buffalo, New York. A public–private initiative, led by Buffalo Niagara Medical Campus Inc., was launched to improve community health. Partnerships were born, community members were engaged, and sustainable impacts have since transformed the city. Intentional community engagement helped Denver, CO respond to the health needs of culturally diverse neighborhoods and make planning processes more resident-led. In a city striving for revitalization, one key asset had been long neglected: an extensive park system. Partners in Flint, MI, set out to make parks a local priority again by building residents’ capacity through facilitative leadership. Since its launch in 2009, an initiative to make healthy living easier called WeTHRIVE! has grown into a “social movement” in Hamilton County, Ohio. What started with 50 people in three communities has expanded to more than 189,000 people throughout 19 communities. This still-growing movement is a result of sustainable thinking from the start. Starting in 2010, leaders in Jefferson County, Alabama faced a series of sobering financial and environmental challenges that impacted their ability to deliver essential services to the region’s most vulnerable residents. Despite these challenges, ongoing collaboration and a spirit of flexible persistence have enabled the county to scale and sustain healthy community change. Thanks to community engagement and a commitment to sustainable thinking, more neighborhoods in Louisville, KY now have safe and affordable housing, access to healthy food, and convenient places to walk, bike, and play. Leaders and residents alike are attuned to the impact that education, employment, housing, transportation, and related issues have on their health. New Orleans, LA, has spent the last decade recovering from Hurricane Katrina. In a city of close-knit neighborhoods, part of that recovery was the addition of over 100 miles of bike lanes around local schools. This success was driven by the KidsWalk Coalition and its commitment to strategic communication and a culture of learning. Socioeconomic differences and health disparities bisect Rancho Cucamonga, CA into two communities with distinct needs. Healthy RC, a city–community partnership, is working to bridge that divide through authentic community engagement. An innovative partnership in Santa Ana, CA is restoring open space so that residents can live safer and more active lives. And by practicing community engagement, facilitative leadership, and sustainable thinking, partners there are working toward lasting change.